I had a chance to tag along and shoot some images last weekend on Lake Texoma with Guide Scott Bridgess in an event Bridgess coordinated with Steve Carlson of Rise Adventures to help some youth with disabilities out onto the water and fishing. 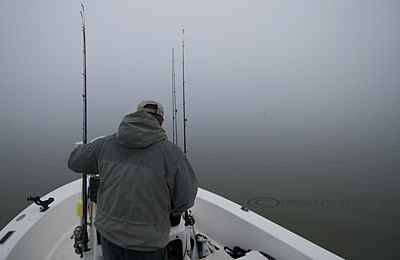 Although we started off slow and in a very unusual fog, we were able to track down some Stripers after lunch and those along were treated to some good Striper action – Texoma style. When it comes to Texoma, there’s no shortage of guides, and there are even boats made locally just for the Texoma Striper business. They have the mass of a bus, and hold almost as many people. Electronics, including GPS and depth / fish finders are key to locating and targeting Stripers for the guide’s clients. Scott estimated there are approximately 80 guides on Texoma Lake proper, and with a lake the size of Texoma at 89-thousand acres, there is plenty of room to fish.